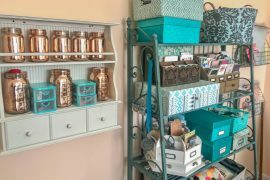 Welcome to Part 3 of a 10-part series called Where We Scrap, where our bloggers share their scrap space with you. This week, Karen Ellis is sharing her space. My Studio Space is not located in my home. I work and do all my designing (with the exception of a sketch book I keep in my purse) in my working studio in Cambridge – The Art House Studio. I love my studio!! Lots of windows and all decked out in my favourite colours – it couldn’t make me happier! I am currently at CHA (Craft & Hobby Association) Trade Show in California with fellow Canadian Scrapbooker peeps Cathie and Connie and co-founders Jackie and Katharina so I can’t take “right now” pics for ya BUT… here’s a little video I took of the studio when I moved into is this fall. Enjoy and remember it doesn’t matter where you create as long AS you create! Love it so much – it fab! I have family and friends who are living in Cambridge – lots of misplaced Newfies there, LOL. If I ever visit them, I’ll be sure and visit you too! Looks interesting. If I get down your way on a mystery ride with certainly stop in to visit. Love visiting stores out of my area (where they are scarce) to see what fellow scrappers and crafters are doing. My trip to Alberta this past summer included stops in scrapbooking stores. I have a patient husband who has been trained to look for beautiful or unusual papers. He has a good eye! Some day….some day….I will visit you in your fabulous space 🙂 LOVE IT! I’m speechless! I grew up in Cambridge and moved away years ago. (many) But my paremts and two daughters lived there. Right up until May 2011 I was desperately looking for somewhere to go for a few hours to scrap and decompress while caring form my mom who had cancer. For three years straight I stayed there only to come home on the occasional weekend to see hubby and scrap. Now there you are right beside my favourite haunt REIDS! Well have to come in this month when I come done for my grandaughters birthday! Cambridge will always be home! Congrats on your new store! All the best see you soon! What a wonderful space to get crafty in! wow Karen, that looks just fabulous!!! Lucky, lucky girl – enjoy that beautiful space!!! Hope I get to see it in real life some day!!! Karen, your place looks great. Next time I am in the area I will come into see you. WowKaren you have an amazing area to work in. I am so jealous!!!!! Would love to see it. Oh my gosh, Karen…I could live here. What a fabulous studio!!! I love your arthouse display wall in the hall. Are you in Cambridge, Ontario? I want to come see your creative space! Thank you sooo much for sharing! Hugs! Karen, your space looks AH-MAHZ-ING !! Next Cropfest Cambridge, we must add a day onto our weekend to visit your studio. LUV.